“Have you noticed the vitality and strength of those Church entities where women exercise leadership and diversity is valued?” (Sandie Cornish in The Francis Effect: Living the Joy of the Gospel 2013: p. 23). On Saturday 25 October, the Archdiocese of Canberra and Goulburn Women’s Commission held its Annual Open Day for 2014. The theme for the day was Backwards, Forwards or Sideways: What Progress for Women in the Church? The Commission invited Sandie Cornish as guest presenter. 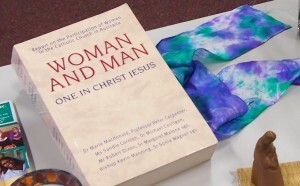 Sandie has worked with many Catholic organisations on social justice issues and co-edited the ground-breaking Australian Catholic Bishops’ Conference Report “Woman and Man: One in Christ Jesus”. Sandie’s current role is Province Director of Mission at the Society of the Sacred Heart Australia and New Zealand. 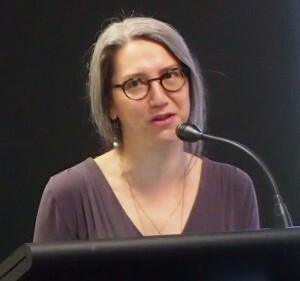 In her presentation, Sandie outlined the Research Project’s genesis through to the publication of its recommendations. She reminded us that the reason why the research was done was to promote the Gospel vision of the equal dignity of women and men. At that time the Catholic bishops were consulting the Catholic community on other issues and decided a wide scale consultation was required to examine the participation of women in the Church. Calls came for research, statements and action on sexism in the Church, women’s role and status in Church and society and women’s contribution to the Church. These calls came from a wide range of people: individuals, women’s groups, the Australian Catholic Social Justice Council and the Moral Theologian’s Society of Australia and New Zealand. From these calls the bishops discerned that a solid information base was needed for theological reflection, pastoral planning and dialogue with women. As a result the bishops decided to undertake research and planning began in 1994 and the report was published in 1999. Sandie went on to explain how the research was done, pointing out that the 2,555 written submissions it received in 1996 made it the largest research project ever conducted in Australia by any organisation including the Australian government! The Research Management Group was appointed in 1995 and consisted of partner members from the Bishops Committee for Justice, Development and Peace, Australian Catholic University and the Australian Conference of Leaders of Religious Institutes (now Catholic Religious Australia). What are the ways in which women participate in the Catholic Church in Australia? What assistance and support are currently offered to women to participate in the Church? What are barriers to women’s participation in the Church? What are some ways in which women’s participation in the Church can be increased? The patriarchal and hierarchal nature of the Church was seen as the fundamental barrier to women’s participation. Sandie outlined some priorities for the participation of women in the Church. A better gender balance – through establishing baseline data, regular monitoring and reporting, a proactive strategy and ongoing resourcing. Finally, Sandie talked those in attendance through the nine decisions that the bishops made in their response to the research report. We examined which of these decisions had been actioned and which still needed some more concerted and adequately-resourced work to be done. These decisions were published in 2000 in the Social Justice Sunday Statement Woman and Man: The Bishops Respond. Sandie certainly gave us a lot to think about and she challenged us to take these priorities back to our parish pastoral councils and communities. Our call to action was to start to put these priorities into practice by gathering data about women’s participation in decision-making and leadership in an effort to gauge our progress in these key areas. She reminded us that this data also needs to be gathered at a diocesan and national level and reported on. Sandie also emphasised that if improving the participation of women is a priority for the Church then appropriate resources must be provided in order for this important work to go forward. This entry was posted in Special interest on November 11, 2014 by Aoife Connors.